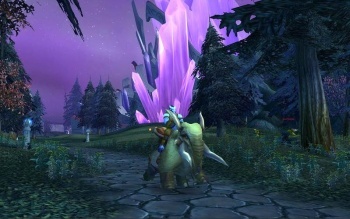 Fourth World of Warcraft Expansion Taking the "Continent Approach"
Blizzard is comfortable with the current cataclysmic World of Warcraft and wants to bring players somewhere new again next time. Blizzard's World of Warcraft: Cataclysm, the third expansion pack for the popular MMO, is unique in that its main feature is the introduction of a massive dragon named Deathwing that destroys everything players knew and loved, or were bored with, from the original game. According to Blizzard lead systems designer Greg Street, the upcoming fourth expansion will keep things as they are, nice and destroyed, and introduce a new continent once again. Speaking to CVG, Street said: "I think the next expansion will be something more like a new continent approach. More like the Burning Crusade or [Wrath of the Lich King's] Northrend, where we send players somewhere new that they haven't seen before." He added that Blizzard might have to polish up some areas of the original World of Warcraft continents, the Eastern Kingdoms and Kalimdor, but that they're pretty much "good now." Still, he admits that completely revamping these old lands with new quests, NPCs, and graphics leaves the previously advanced expansion worlds in a tough spot. "On the other hand we have this weird story now where you almost go back in time when you hit the Burning Crusade and Lich King content," he said. "We're going to have to do something to bring that up to speed." He's referring to the fact that once players finish up with the original lands and take the portal to Outland in Burning Crusade to level up to 70, the whole world starts talking about the menace of Illidan, while the early game is all about the much larger, scarier, and angrier terror of Deathwing. Street thinks that Blizzard will have to make that story transition "a little smoother" in an upcoming patch, or possibly the fourth expansion pack. Street continued to say that Blizzard "wants to get expansions out on fairly regular schedules," and won't be resting on its laurels now that Cataclysm is on the verge of launching on December 7. He didn't give an indication of where the next continent he refers to would be, but theories put it in areas such as the Emerald Dream or even on the dark side of Azeroth, with Old Gods, more of the Burning Legion, or a mighty Sheep/Cow Deity (that's my theory, anyway) up to naughty deeds. I'm sure we'll hear plenty of speculation and rumors about it in the near future now that Cataclysm has been shoved out of the door.